“¡Juntos!” ("Together! "), says Marsha Parrilla good naturedly as she watches members of her company, Danza Orgánica, work through a piece at the Tony Williams Dance Center in Jamaica Plain. Company members practice movement and together with Parrilla, choreographer and founding artistic director, decide how to best embody the work. This inclusive approach makes their performances powerful and their social justice work resonant. 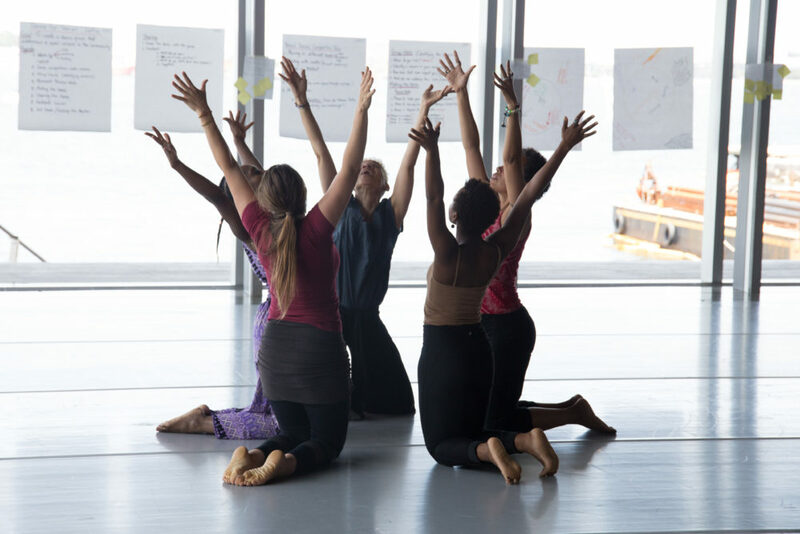 The contemporary dance theater company, launched in 2007, uses dance as a tool for social change by creating work with diverse narratives and engaging various communities in "Dance For Social Justice Workshops." The workshops — with curriculum informed by Paulo Freire’s “Pedagogy of the Oppressed” — are open to everyone, but sometimes center around themes like environmental justice or cater to specific populations such as indigenous groups or women of color. Parrilla cultivates a space where people can talk about what's on their hearts, including personal trauma. There, they can be heard and then express ideas through movement. The next workshop occurs Saturday, Feb. 9 at First Church Boston as part of a week-long Art & Spirit residency, helmed by Rev. Tim House and sponsored by an artist parishioner, that aims “to bring in art that stirs people in different ways,” House says. The workshop will not have religious content. Through a guided process, participants explore some basic elements of dance composition and then develop pieces in small groups. The workshops started when Parrilla, who was born in Puerto Rico, taught Spanish in New York. Students tackled issues in their communities and worked out how to change them through research papers. Later, when teaching dance, she incorporated movement. Over the years, the workshops have been offered in a variety of settings, from colleges to art institutions to local nonprofits. 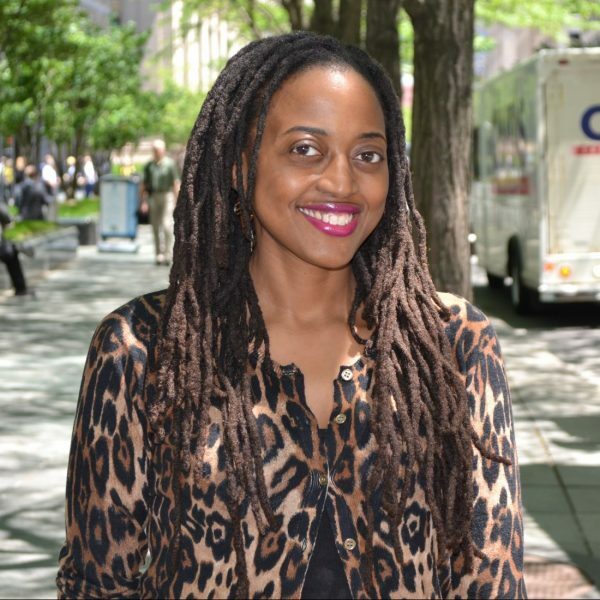 Last summer, Parrilla — a 2018 City of Boston Artist in Residence who has received grants from the New England Foundation for the Arts, the Massachusetts Cultural Council, The Boston Foundation, and numerous accolades — facilitated a workshop for Sisters Unchained, an organization that builds community with young women of color whose loved ones are currently or formerly incarcerated through radical education, activism and art. The opportunity for self-reflection and building with other people makes these workshops important, Aubourg explained. Parrilla “creates intentional space for movement and also sharing and telling our stories,” physically and verbally, she said. 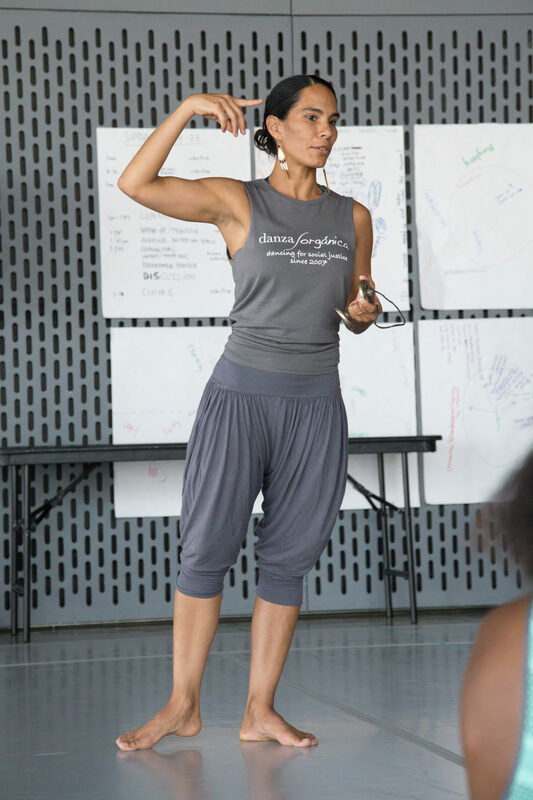 The young activist first worked with Danza Orgánica when Sisters Unchained partnered with the company on the dance theater suite “Running in Stillness,” focused on the impact of mass incarceration on women and families, in which she performed. Victoria Sagardía, a Danza Orgánica member, has learned about how the body holds trauma, the importance of sharing and the support participants give one another. At one workshop, a group of middle school girls made protest signs and incorporated those signs into their dance, she said. But the most beautiful part she claimed, “is watching people go, 'Oh my God! I get to dance!' "
Typically, by the workshop’s end, “everybody ends up either in a circle or embracing each other or connecting in one way or another,” shared Parrilla. That’s the goal: for everyone to feel they belong and to realize we’re not that different from each other. Marsha Parrilla’s “Dance for Social Justice Workshop” is Saturday, Feb. 9, at 9:30 a.m. and 12:30 p.m. at First Church Boston in Roxbury. Danza Orgánica will also perform excerpts from “Seeds,” on Sunday, Feb. 3 at 11 a.m. and excerpts from “Melaza,” on Sunday, Feb.10 at 12:30 p.m. at First Church. A “Dance for Social Justice Workshop” for self-identified women of color will take place Saturday, March 30, from 1 to 4 p.m. at Hibernian Hall in Roxbury.